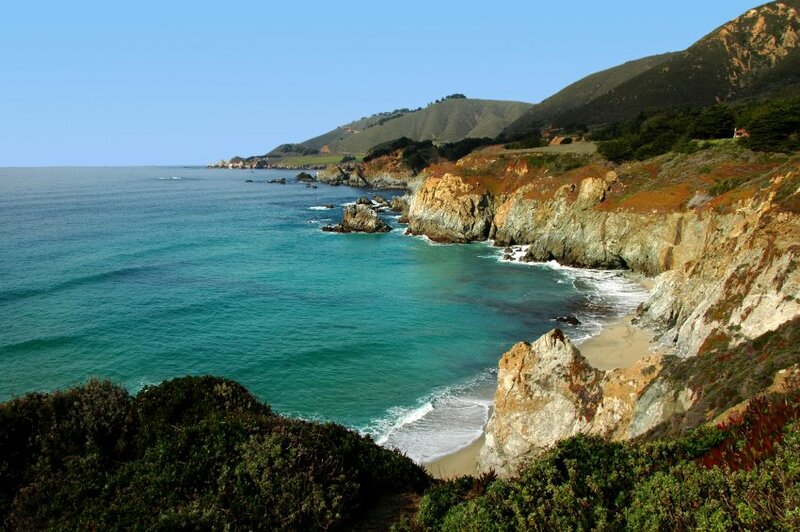 Central California's Monterey Bay Peninsula offers some of the most dramatic coastal views in the world. The winding Monterey coastline varies from wooded, rugged and rocky to fishing piers, crashing surf and white sandy beaches. Sea life is abundant. It is not uncommon to see playful sea otters, harbor seals, barking sea lions and pods of migrating whales in the Pacific Ocean's blue waters. Although most of the Monterey Peninsula's towns have succumbed to tourism in one way or another, nature is still a priority for many of the residents, and some of them are devoted to protecting the area from overdevelopment. From Santa Cruz—the original surf city—on the north end of Monterey Bay, to the cozy village of Carmel on the south end, each of the bay's oceanside enclaves has its own personality. Two communities sit on the north end of the bay: Capitola and Moss Landing, an old whaling village. Monterey, the largest bay town, is located in the center of the peninsula and has three different areas to tour: Monterey State Historic Park with its historic adobe buildings, Cannery Row and Fisherman's Wharf. Cannery Row is worth a day of exploration. You won't find much resemblance to Steinbeck's description of the area in his 1945 novel of the same name, but you will find many candy shops, T-shirt stores, restaurants, small beaches and the wonderful Monterey Bay Aquarium, which houses some 550 different underwater species. Pacific Grove prides itself on being America's last home town as well as Butterfly Town USA, where millions of orange-and-black monarch butterflies spend their winters each year. The gated community of Pebble Beach is known worldwide for its golf courses and its 17-mi/27-km drive of spectacular ocean views. Charming Carmel-by-the Sea is a village full of art galleries, boutiques and small shops that attract beach lovers and retired movie stars. The Monterey Bay Peninsula's fairly constant 65 F/18 C temperature and more than 200 annual special events make the area a popular destination for visitors. Author Robert Louis Stevenson rightly called the peninsula's Point Lobos State Reserve "the greatest meeting of land and water in the world."